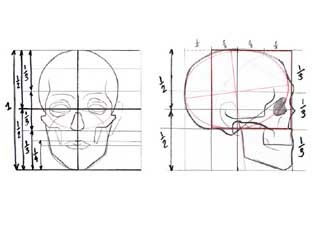 Before attempting drawing a portrait we recommend to practice drawing the human skull from various views such as the frontal view, the side view and the 3/4 view (as shown in the video). This is the foundation of portrait drawing. Look at the picture that shows the correct proportions of the human head. 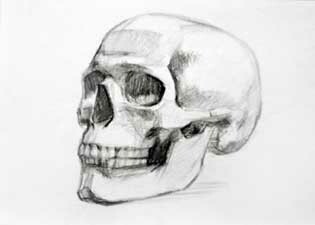 Study the proportions before attempting to draw the 3/4 view of the skull. Try to get a model of the skull (you can usually get them in the art supply shops) and draw from the model rather than from pictures. Pay close attention to proportions when drawing. The first stage, that of building the construction is the most crucial stage. For serious students we recommend also getting a good anatomy book and studying it thoroughly. Proportions of a human head. Sketch of a human skull.